Microsoft limits the type of files and programs that you can pin to the start screen of the Windows 8 operating system. It is basically the same limitation that is imposed on the taskbar of Windows 7 and newer versions of the operating system. And just like it is possible to use third party software to pin anything to the Windows taskbar, third party software exists to pin anything to the start screen of Windows 8. A program like Start Screen Pinner can do that for instance, and this could be the end of the article, were it not for the fact that you can't run the program under Windows RT. If you have purchased a Surface RT, or any other device running on Windows RT instead of Windows 8, you are limited to apps made available in the Windows Store. 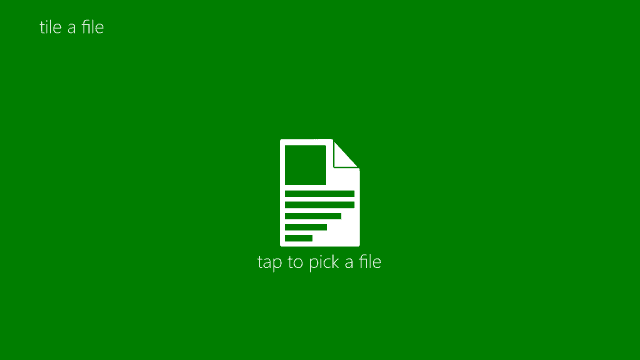 Tap A File is a new application for Windows 8 and Windows RT devices that you can use to add any file on the system to the start screen of the operating system. Use has been optimized for touch-enabled devices, but mouse and keyboard are supported as well. To start, simply click on the one and only button displayed when you start the application. This opens a built-in file browser that you need to use to pick the file that you want to pin to the start screen. You are taken back to the first page of the application where you need to click (or tap) on the button again to add the file. It is not really clear why you need to tap it again, as it would make sense to automatically add the file after you have selected it.